Tonight the first of three storms is moving into Western Washington, so I got out for a quick trip to my local city park (Gene Coulon Park in Renton) for an hour. I could have photographed the Canada Geese that hang out there but went for the fall colors instead. The geese will be there all winter the fall color will only be there a few more hours, the next sunny day we have there will only be bare branches at the park. More fall color at Gene Coulon Park. If you live in the Pacific Northwest and can, get outside today, it's gonna be a wet rest of the week. The Oregon Coast is a fabulous place to create landscape images, with a little luck and some patience, it might all come together. the subjects are all there, it's the light that is sometimes magical, and those are the times we want to shoot! The first afternoon/evening session was at Siletz Bay and the Three Brothers this is a great place to start and dust off the camera gear and get start getting into the "landscape" mindset. On Siletz Bay near Lincoln City the Three Brothers stand guard just off shore from where the Siletz River enters the bay. The second day of the workshop was rainy and foggy, I'm still working on those images trying to figure out if I want them to be black & white images or not. So in the mean time I'll just skip those. I like to stop at Moolack beach just north of the Yaquina Head Lighthouse for the view of the lighthouse standing on the edge of the ocean. Sometimes though the surprises are in the other direction. By shooting looking north these bluffs look like the Napali Coast of Hawaii or someplace exotic like that. The slow shutter speed caught some cars coming around the bend in the road as well. Looking north up Moolack Beach. I like this lighthouse because the land it sits on jets out into the Pacific, It looks and feels like a lighthouse should. The location is dramatic, and often the clouds and lighting are too. The weather was good so we went down to Cape Perpetua and Thor's Well for a little excitement. The water comes up through Thor's Well before it drains back in. The water blasting out of the hole is hwer photogrphaer's need to keep thier gear dry. The water draining back in Thor's Well is the standard image these days, but there's also something about the water blasting out that makes a pretty dynamic image as well. The next morning from the hotel parking lot, I could see a few bright stars, so I knew it would be good at Pacific City. Wow was it ever! Pacific City, Haystack Rock and Cape Kiwanda on a fabulous morning of light. The beach at Pacific City just before sunrise. Haystack Rock and the golden sandstone of Cape Kiwanda at sunrise. Haystack Rock and the golden sandstone of Cape Kiwanda in full morning light. Often in late summer and early fall Common Murres can be found on beaches and rock jetties. They molt or shed all of their primary feathers (flight feathers) at once so they can't fly. But because they also use their wings to fly underwater, when they don't have their flight feathers they can't swim and chase fish as well. It's as if, when they need food the most (growing feathers takes a lot of energy) it's the most difficult for them to chase fish. My theory has always been that they come ashore to conserve energy and warm up. Their body temperature is about 100 degrees and they can lose heat quickly in the cold Pacific waters. If you come across a Common Murre or any other bird it might not be injured or sick, it could just be resting waiting for the next high-tide to take it back into the water. Newport Bridge in teh afternoon on a scouting stop. Newport Bridge way after sunset and a really long exposure. It was a great week on the Oregon Coast we also stopped at the North Fork of the Yachats River Bridge, one of 50 remaining wooden covered birdges in Oregon, Seal Rocks, Agate Beach, hiked up to the top of Cape Kiwanda and hiked up part of the Cascade Head trail. My first stop for the harvest workshop, a red barn and a harvester, blue sky and some clouds! What more can you ask for. Well, we had one 104 degree afternoon, some rain, a lotta sunshine, and I think we each took several thousand images. It was nice to have some clouds in the sky to breakup all that blue. While I love the Palouse in any season, I like the harvest time best. I think it's because I like the gold and yellow hues. I used the 70 to 200 mm zoom as much as, if not more than the 17 to 40 mm wide angle zoom. I like isolating the subject with the telephoto lens. Like the image below where I was able to keep some telphone poles out of the image. I photographed this tree last year, and wanted to come back. I'm glad I kept good notes last year! This year with the clouds it looks so much more dramatic. 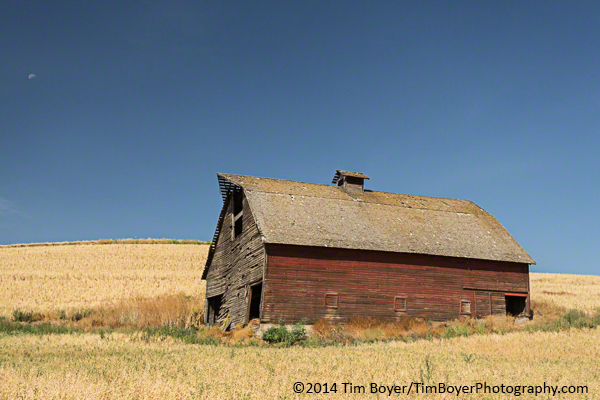 I explore a new area of the Palouse everytime I'm there and with 4,000 square miles there's still a lot to discover. This reminded my of Dorthy and maybe living in Kansas after the tornado took her to OZ. This is my favorite image of the Uniontown Wheel Fence. I like the spiky wheel, and I think the whole fence looks better with golden wheat behind it. Steptpe Butte and the Baylor Road Tree after sunset. I got a chance to talk to one of th e owners in May, so it's special to see a farm still being worked by the 5th generation. It really did rain a few minutes later, but not very much, just a passing storm. Sunset from Steptoe Butte finally I got some great light with clouds after several visits. Rain clouds giving out a downpour in the distance, just glad it wasn't on us. Gotta love a clear morning and beautiful light! My favorite truck inthe Palouse (so far). I think I've been here four times now. This is the full frame shot of the Palouse 10 to 15 degrees off the sunset. I know I wanted the center section for the final image. I was using the 70 to 200 mm lens at 200mm, trying to isolate the rolling hills. Here's a full frame view of the sunset from near Kamiak Butte. Here's the final image after cropping out some of the sky and all of the foreground. To isolate the subject, either use a longer lens or you can crop in post processing later as I did here. I use both techniques, but here I cropped because I wanted the the whole width of the hills. I also took a four frame pano of this scene which woudl be a third way to isolate just the rolling hills in filtered evening light. Here's teh cropped version that I knew I would get out of the image I took above. It was a great trip, plenty of photographic opportunities and I think everyone had a great time. I'll be leading another workshop next year the workshop dates will be July 25th through 29th with 4.5 days of photography, four sunrise/morning sessions and five afternoon/evening session. We get up early and stay out pretty late so a break in the middle of the day offers a good chance to catchup on some missed sleep. It's hard to beleive that my four days in the Palouse are over and I'm headed to Malheur National Willfie Refuge today. Here are a few images from the last four days of early mornings, late evenings that included a whole bunch of photography and a few laughs along the way. A classic Palouse sunset from Steptoe Butte started the workshop off in the right way. The Palosue sunset from Steptoe Butte but faced nearly into the sun producted these warm colors. Palouse Falls at sunrise. A very early morning, but worth the long drive and sleepy eyes. A magical place. Wheat Patterns and blue skies. Sunrise from Steptoe Butte on a windy day. Use teh car as a wind break and push the ISO up for a faster shutter speed! Palouse patterns from Steptoe Butte. Two shapres of Green. Really two different crops and more blue shies -- where are the clouds? What a fantastic place! We had blue skies and very few clouds, the clouds would have added something to the sky, but for a guy who lives on the west side of the state, all sunny days are a bonus! Just a short post I'm off to Malheur for a 3-day bird photography workshop. I have a nice Singh-Ray Warming Polarizer Filter that screws onto my camera lenses, and I have some Lee Filter Graduated Neutral Density Filters. But, I often want to use a Polarizer and a Graduated Neutral Density Filter at the same time. Here's how I solved this problem. There are two ways to do this. One is to screw the Polarizing Filter onto the lens then screw the Lee Filter Adapter onto the Polarizing Filter, and then attach the Lee Filter Holder. By stacking the two filters, it’s difficult but almost possible to turn the Polarizing Filter to get it to work. The second problem with this system is that, with a wide-angle lens, there is an incredibly large amount of vignetting in the corners of the image. Another approach (and the one I'm using now) is to put the Lee Graduated Filter on first with the standard Lee Foundation Kit (filter holder) with the Lee Filter Adapter (77 mm for my Canon Lenses). Then attach the Lee Filters 105 mm Accessory Front Thread Adapter (four screws hold it on the Foundation Kit, some assembly required). Then the Lee Filters 105 mm Landscape Circular Polarizer Filter (this is thinner then the regular 105 mm Circular Polarizing Filter) screws into the Accessory Front Tread Adapter. Slightly more expensive, Yes! But, no vignetting, and it’s easy to use the Graduated Neutral Density Filters and turn the Polarizing Filter! 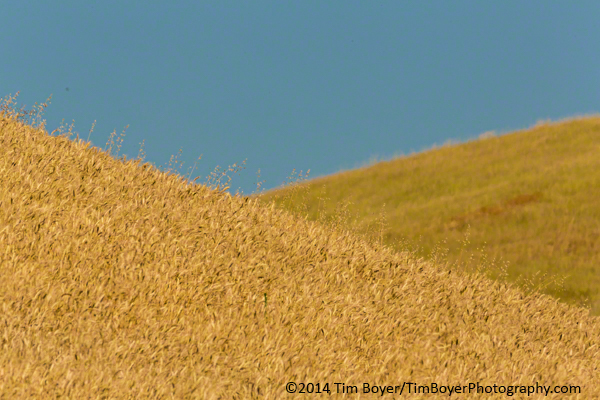 Here’s what it looks like, when I was in the Palouse on Steptoe Butte on the 70 to 200 mm zoom. Here's one of the images I made while using this system. So far, I've used this in the Palouse and the Columbia Gorge. It works, and it's made my post processing a little faster & easier. 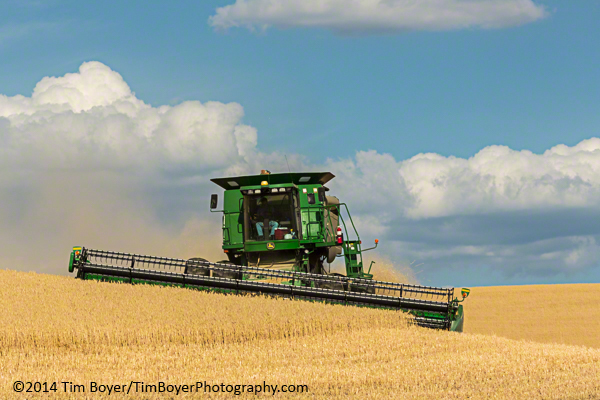 While this was my second time photographing in the Palouse, I enjoyed it so much more this time. It was fun to drive around and explore the backcountry roads and there was a fair amount of excitement anticipating what was coming around the next curve in the road, or over the top of the next hill. One of my favorite experiences was driving up a hill and reaching the crest. The wide open landscape was exposed slowly, the sky, the distant hills, then the wheat fields in front of us. Then I'd hear a wow, or a that is so cool, or a oh my God! It's that kinda place. Beautiful, expansive, wide open sky and wide open for exploration, the creative mind can flow and wander the opportunities are boundless. This trip was about exploring the back roads, to see more of the less traveled landscape. I'm not sure I did it as much justice as it should have, but I'm already planning my next trip, to photograph the iconic places, and to explore more of the open, vast terrain. Steptoe Butte and a lone tree. Pan blurr of thte Palouse wheat fields from Steptoe Butte. A mix of harvested wheat and green fields from Steptoe Butte. Harvester from Steptoe, taken with a 400mm lens. Finally some golden light on golden fields. It was worth the wait! I used the 100 to 400 mm lens from just below the summit of Steptoe to isolate the textures I liked the most. 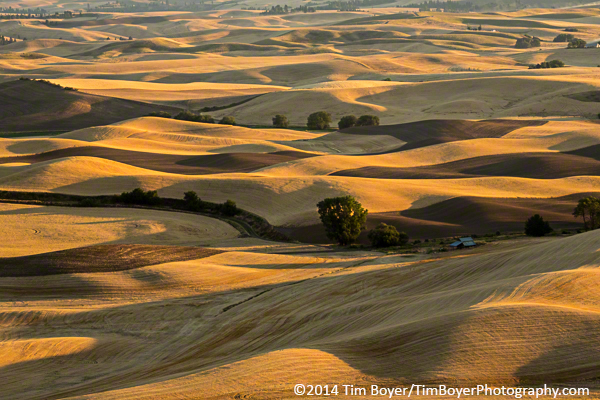 Harvested fields from Steptoe Butte.Golden light filtered through the end of a dusty day. End of the Day harvested wheat field textures from Steptoe Butte. Most of the fields had been harvested already, and it rained the prior day to our visit, so there was no harvesting as the wheat was drying. On day two, however, we came across some harvesters close enough to the road. Next year I'll get this with a wide angle, and I'll be there earlier! Harverster coming aroudn the corner. I don't shoot cars very often, but I liked this truck, its rust, the well used condition, the old wooden tool box on its flatbed, we spent about an hour getting the details, finding angles and just enjoying it. A retired old Chevy truck abandon on a back country road. 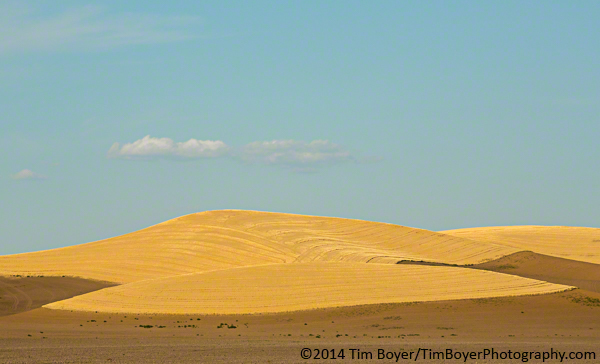 The Palouse is famous for all of the lines, forms, textures, that create endless composition possibilities. There's just so much, the hard part is focusing in and isolating just one part. Patterns textures and abstract shapes. Harvested fields and tilled Earth. Tilled barren ground and harvest wheat fields detail. Bi-plane crop duster getting ready to come aroudn and take another pass. 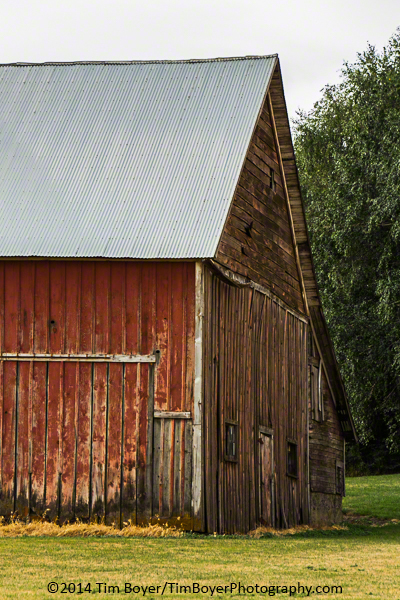 The old barns and classic reds are there, but I like the older barns with the original rusty brown red, not the newer bright red. Just another red barn out in the wide open sky. The reamining building of the town of Wilcox. Three days in the Plaouse is only enough to scratch the surface. I'm going back next month, and then I'm going back in the winter too. I want to see how it all changes. I'm planning workshops for next year, email me (tboyer@seanet.com) if you're interested, the details will be on the website in a few weeks. In May, 2015 we'll do the classic green hills, flowers and all of the iconic locations, in late July, 2015 we'll do the harvest of golden wheat, we'll look for opportunities to get close to those big harvesters and get some dramatic compositions. It will be fun, and there will be some places we'll have as destinations for a specific photo opportunity. But, I think the exploration of the Palouse is part of the experience, so we'll leave room and time open for just seeing what unfolds before us on the back roads of this incredible landscape.